Mac Brunckhorst on The Penguin (18), the Sundeck (a.k.a. Wave Wall), the Grampians. Photo: Chelsea Brunckhorst. Climbing in winter in Victoria is hit and miss. On the one hand, a brisk, clear day produces perfect 'send' conditions. On the other, Victorian winters are typically rainy, which can seriously decrease the fun factor. Still, there are places you can go – some interstate and others local – to get some quality climbing in during our wettest months. When it's cold down south, the bleedingly obvious thing to do is head north. And, what's more north than Queensland? Frog Buttress is a compact crag in the Mt French section of Moogerah Peaks National Park, 85km south-west of Brisbane. Most definitely a trad crag (the bolting is minimalist), Frog is renowned as one of the best destinations in Australia for crack climbing. Pros: Easy, five-minute access. Quality single-pitch climbing. Cons: Not a good place for top-roping, because the clifftop is loose. Also, if your crack climbing technique is lacking, you're going to get schooled. Full rack, with at least one full set of cams (a double set is better – some cracks here are pretty much the same width the entire length of the climb). Rope: 50-60m rope – bring two to get off the longer routes. Hexes are handy. And, if you plan on climbing the thinner lines, you'll need microwires and RPs. Nina Scott-Bohanna on A Day at the Beach (20), Nowra. Photo: Chelsea Brunckhorst. 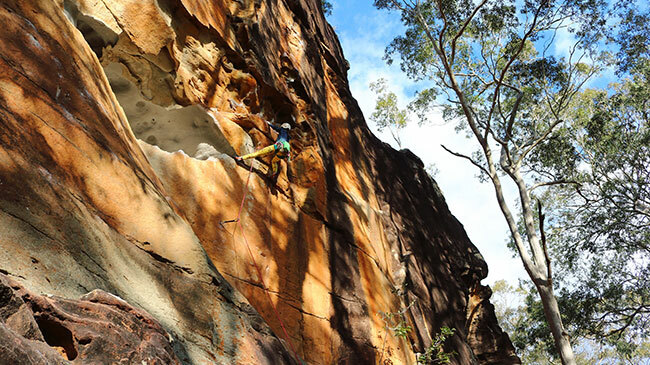 The ancestral home of sport climbing in Australia, Nowra is a clip-and-go paradise. It's an urban crag, spread across cliffs around the town of Nowra, about 2.5 hours from Sydney (or 9 hours from Melbourne – which is a very drivable distance if you're splitting the driving between a couple of you, and you're going for longer than a weekend). You can stay in Nowra, or anywhere along the coast, which is only about 20 minutes away. Plus, thanks to mild weather, you'll actually be able to enjoy the beach. Combined with Nowra's frictionous rock, a crisp winter day offers perfect 'send' conditions. If you've lucked out with rainy skies, there are cliffs you can still climb in Nowra without getting saturated. What's more, sport climbing offers potential for lots of mileage. As if you need more reasons, the white sands of Jervis Bay are a short drive away. Also just 40 minutes away is Point Perpendicular, which offers equally amazing climbing. (Though, it's very different, and you'll need a full rack if you plan on climbing there). Cons: Ticks. As in, bitey bugs. Also, Thompsons Point on a weekend = #busy. Sport rack; 50–60m rope; a stick clip comes in handy, too. If you're not up for a trip interstate, Victoria has plenty of crags you can squirrel away in, if the heavens are damp. The Gallery is one of these crags. It's a cave that's so steep, most of the lines are protected from light rain. Apart from a couple of easier trad routes, the climbing is upwards of grade 23. Pros: Climbable in wet weather. Cons: Access is a steep, 45-minute slog up a hill. Sport rack; 50–60m rope; and, a stick clip is useful for the bouldery starts. Although the routes here aren't completely protected from pouring rain, the wall itself is steep enough to climb in light rain. Plus, it's a sun trap. On a bluebird winter day, it's a pleasant crag to hang out at. Although the walk-in is a bit of a pain (up a steep-ish hill, through a cave and out the other side), it offers moderately graded sport routes, mostly between grades 18–21. Significantly, it's located in the sunny Northern Grampians, which generally receives less rainfall than the moody South. In fact, many cliffs in the Northern Grampians are suitable for winter climbing. That's because conditions in the North tend to be better, because this region shares its weather more with nearby Arapiles than it does with the Grampians town of Halls Gap. To find out which crags see the most sun, have a look in the Grampians Climbing guidebook, in which the start of each chapter has symbols to indicate the time of day each crag sees the sun. Pros: A sunny cliff. Moderately graded sport routes. You can get away with a sport rack if you're not interested in the trad lines. Also, 50–60m rope; and stick clip. This short but quality cliff in the North-West Grampians is a good winter option for several reasons: It gets winter sun most of the day. Plus, the walk-in takes five minutes, which means that bailing is quick if it starts pouring with rain. What's more, Black Ians offers some of the better crack climbing in Victoria. Pros: Variety of grades. Sun most of the day. Five-minute walk-in. Access to the clifftop is easy. Cons: If it rains, you'll get wet. Also, if you're staying in Halls Gap, driving to Black Ians takes about an hour. There are some sport routes, but you'll get the most value with a trad rack. Rope: 50–60m. The Pharos, Arapiles. Photo: Chelsea Brunckhorst. 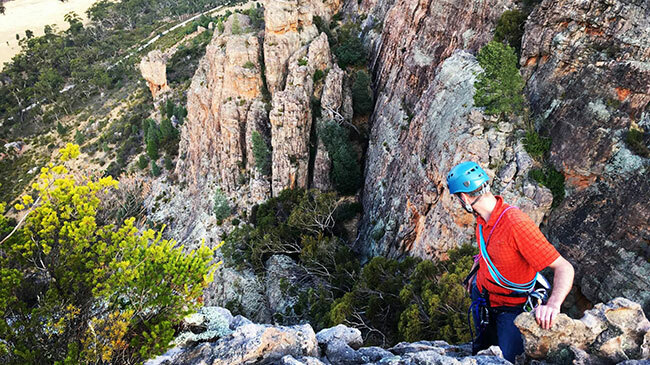 You can chase the sun at Arapiles, by choosing cliffs that get the most sun in winter. (Central Gully Left and the Watchtower faces, for example.) The Arapiles Selected Climbs guidebook offers sun/shade symbols for each cliff, depicting what time of day the cliff gets sun, with notes regarding both summer and winter. Most cliffs at Arapiles come into shade in the afternoon; so, in winter you're looking at early starts and early finishes. Pros: Many cliffs to choose from. Many styles of climbing. Cons: Getting lost high up on Tiger Wall in a downpour could be character-building. 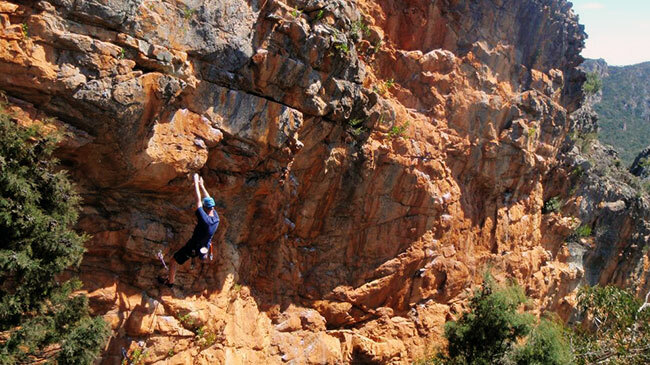 For a winter climbing option that's closer to Melbourne, consider Werribee Gorge. It isn't the prettiest crag in the state, nor the best quality rock. But, it's a convenient crag to get to if you only have time for a daytrip. The cliffs at Falcons Lookout see sun for most of the day – Veni Vidi Vici Wall is north-facing and gets sun all day, while the Amphitheatre faces east and gets morning sun – which makes it a good winter crag. The only trouble is, the rock can be slippery, even when it's not raining. And, being just an hour west of Melbourne, on a fine-weather day it's likely to be overrun with organised groups and abseilers. Pros: One hour from Melbourne. You'll need a full rack, and 50–60m rope. Also, we recommend a helmet, because the clifftop is loose. The cliff is also accessed from above, so there are always going to be people above you, potentially kicking rocks around.